Delaware Hayes second baseman Cole Barton looks to tag out a Thomas Worthington base stealer during Thursday’s OCC showdown in Delaware. The Delaware Hayes baseball team used a big inning to erase an early deficit, but visiting Thomas Worthington used an even bigger one to roll to a 15-5, five-inning win Thursday in Delaware. The Pacers, who trailed 4-0 after the top of the first, answered with five in the second to take a brief lead. Brandon Flannery had a two-run single, Dominic Byers knocked him in with a single of his own and Zach Miller came through with a clutch two-out, two-run single later in the frame to cap the big inning. Thomas Worthington, though, had an answer. After the teams traded zeros in the third, the Cardinals erupted for 11 runs in the fourth to all but seal the deal. Zach Price and Isaiah Moore had two hits apiece in the setback while Mason Davis was the starting and losing pitcher for Hayes. Big Walnut 15, Franklin Heights 0, 5 inn. Carson Becker, Wes Coey and C.J. Rockwell combined for a one-hit shutout and the offense took care of the rest as the Golden Eagles cruised past the Falcons Thursday afternoon. Becker and Coey pitched two innings apiece, combining for seven strikeouts. Rockwell then struck out the side in the fifth to seal the deal. Becker helped himself at the plate, finishing with a game-best three RBI, while Sam Medley finished with two hits, two RBI and three runs, Colton Lee added two hits and Austin Krinn scored four times. 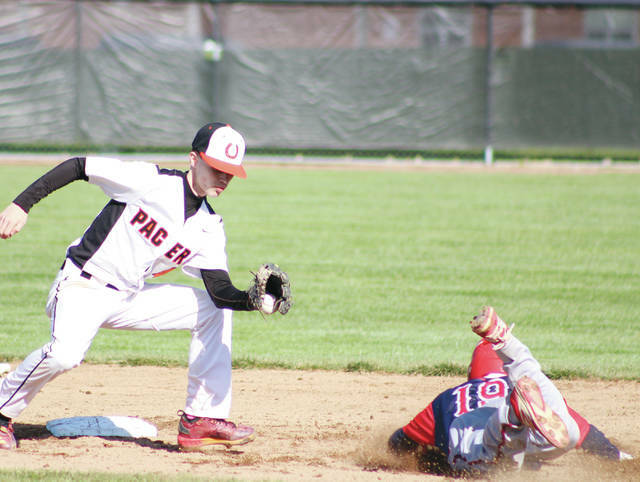 Corbin Parrish stole home to give the Patriots a lead they parlayed into an OCC win over the visiting Warhawks Thursday in Powell. Parrish and Craig Lutwen finished with two hits apiece while Michael Osmond picked up the win on the mound. Also: Northridge 11, Delaware Christian 1, 5 inn. Tree of Life scored seven runs in the second and three more in the third to take a 10-1 lead, but host Delaware Christian dominated the rest of the way en route to a 14-11 MOCAL win Thursday at Liberty Field. The Eagles’ rally started with a three-run third before they plated four in the fourth and six in the fifth to cap the comeback. Anna Fuller powered DCS’s 13-hit attack with a 4-for-4 performance. She knocked in four and scored a pair. Haileigh Darnell also had a big day at the dish, finishing 3-for-4 with five RBI and two runs scored. Emily Parrish, meanwhile, finished with two hits, three RBI and two runs while Grace Williams added two RBI of her own. Parrish picked up the win in the circle, allowing one unearned run in four hitless innings of relief. She struck out nine and walked just one. Westerville North 4, Olentangy Orange 3, 8 inn. After seeing the Pioneers plate a run in the top of the eighth inning to take a late lead, the host Warriors responded with two in the bottom half to nab a walk-off win Thursday in Westerville. Alex Ronk led Orange with a pair of hits while Cami Clarkson and Heather Higgins had an RBI each. Also: Pleasant 11, Buckeye Valley 4. Big Walnut was sharp Thursday, sweeping away visiting Groveport 5-0. Golden Eagle winners included Gabe Mexicott (6-1, 6-1 at first singles), Cameron Sutherland (6-1, 6-0 at second singles), Charlie Jaeger (6-1, 6-3 at third singles), the duo of Sebastian Kirkpatrick and Devon McCullough (6-0, 6-0 at first doubles) and Collin Bates and Riley Shumaker, who won by default at second doubles. Also: Olentangy Orange 5, Westerville North 0; River Valley 4, Buckeye Valley 1. Olentangy Liberty knocked off visiting Olentangy Orange Thursday, winning the first set 25-12 before smoothing out the scoring summary with wins of 25-23 and 25-12 in the second and third, respectively. The Patriots were led by Nick Irelan, who had a game-high 17 kills. Sean McCabe led Liberty in assists with 22, Shiva Dubbaka had a team-leading 16 digs and Rithvik Potluri had four aces in the win. Also: Olentangy def. Westerville South 25-2, 25-2, 25-13. Luke Schmeling had a had trick, with his third goal knotting the game at six early in the third quarter, but Bishop Watterson scored three of the game’s final four goals to notch a 9-7 win Thursday at Pioneer Field. The Patriots took a 3-2 lead into halftime, but had trouble cracking the Golden Bear defense in the second half of Thursday’s showdown in Powell. Tyson Chapman, Johnny Wiseman and Alex Theuerkauf found the back of the net to lift Liberty to its halftime edge. UA scored three unanswered goals in the third quarter to take control before Aidan Kenley scored off a feed from Wiseman to account for the final margin. Dublin Coffman 12, Olentangy Orange 9; Gahanna 9, Big Walnut 5; Dublin Jerome 12, Olentangy 6. Ohio Wesleyan 13, Franciscan 10. Ohio Wesleyan 10, Otterbein 2.